Britain's abolition of the slave trade in 1807 did not end the traffic of human beings across the Atlantic. Indeed, for many decades to come, hundreds of thousands of enslaved Africans continued to be shipped into slavery. From 1840 to 1872 the remote South Atlantic island of St Helena played a pivotal role in Britain's efforts to suppress the slave trade, and over this time it received over 25,000 'liberated Africans', taken from slave ships by Royal Navy patrols. Conditions aboard the slavers were appalling, and many did not survive the journey. Rupert's Valley therefore became a graveyard to many thousands of Africans - 'a valley of dry bones' in the words of a visiting missionary. In 2008 archaeological excavations uncovered a small part of that graveyard, revealing the burials of over 300 victims of the slave trade. It was disposal on a massive scale, with the dead interred in a combination of single, multiple and mass graves. 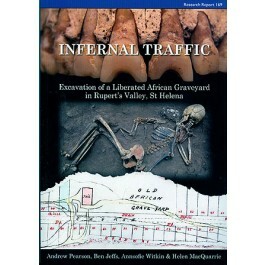 This book presents the finding of the archaeological and osteological study, and in so doing brings the inhumanity of the slave trade into vivid focus. It tells the story of a group of children and young adults who had lived in Africa only a few weeks prior to their death on St Helena, and whose remains bear witness to the cruelty of their transportation. However, the archaeology also shows them as more than just victims, but also as individuals with a sense of their own identity and culture. The slave trade continues to this day, and although this book is a study of the past it also serves as a reminder of evils that persist into the modern day.